I have some left over from the kit what is the best way to use it? Can it protect? I'm doing some prosperity work for my family. The past 2 years have been quite challenging, financially which caused a huge strain on my relationship. and while I dont believe we've been crossed or jinxed per se, i do believe weve just had some pretty bad luck. 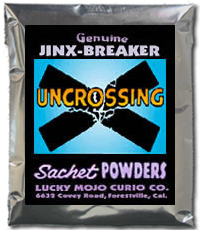 can i use uncrossing to help end this bad luck along with other prosperity, money and love products? I would start with a reading to determine the cause of your misfortunes - whether it's just naturally occuring, or maliciously sent. Then you can get personalized advice on exactly what forms of cleansing/uncrossing would work best for you, and then what forms of drawing work would work best. Of course you can also try working the Uncrossing spell kit, and then do a Van Van kit to open the way, and then follow that with the drawing kits for your various intents. I have Uncrossing sachet powder. I’m currently lighting Uncrossing Vigil. I read about wearing the powder by sprinkling it to one’s body. Since I’m using other work’s oil on my body, I don’t want the scent to be overpowering. Can I sprinkle it inside my shoes, or is that method just to cross somebody? Thanks. Sprinkling Uncrossing Sachet Powder in your shoes is a great and time-honoured way to work. Two other sachet powders often worn in the shoes for similar purposes are Jinx Killer Sachet Powder and Fear Not To Walk Over Evil Sachet Powder.